On Friday night, we went to our first PEI ceilidh at the Emerald Boxcar Pub and Grill. The reason we went was because of John Webster. He plays guitar in the band and we know him because of his day job. He works at Royalty Hardwoods and this is where we bought a lot of our wood. 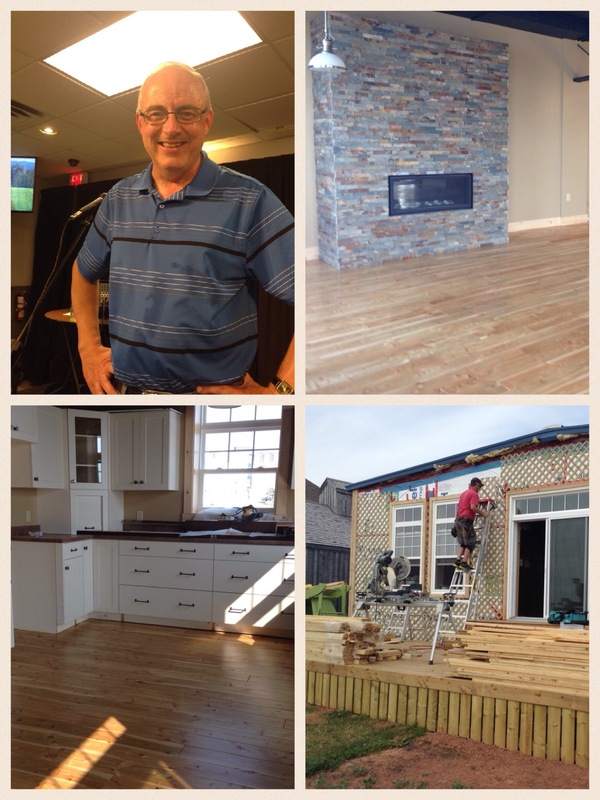 We bought the tamarack flooring as well as the white cedar siding and the butcher block top for the island. The following pictures are of John Webster and of our wood that we bought from Royalty Hardwoods. The floor is looking great – just two more coats of varathane to go! The other shot is of the outside. William is putting up the siding and had to strap the exterior walls with lattice first. The big pile of lumber on the deck is the cedar siding we bought from Royalty Hardwoods. Here is an article on Fiddlers’ Sons from the Journal Pioneer (the local Summerside paper). The band is really good and we thoroughly enjoyed the ceilidh. The two girls step dancing were ages 8 and 12 – pretty amazing dancers! I recorded some of the ceilidh on my phone – we were sitting near the back, so I didn’t get that great of a video, but you should get the gist of it – very impressive band and we’ll definitely go and listen to them again!